Originally posted at Mon 21-03-2011 21:20:51, in the misc category. 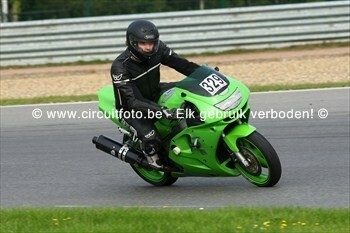 I have a Kawasaki ZX6R from 1997, for use on racing tracks. It has no break lights, indicators or mirrors, it's just a cool but very plain racing motorbike. However, as you can see on the right, it's also green. And since I don't like that typical Kawasaki color very much, I decided to do something about it. Since I know a professional spray painter, I decided to give it a new paint job: it's now a matted black with goldish rims :-D Yes, I know, that's wrong in almost every possible conceivable way, but I just liked it ;) Be sure to check out all the photos.